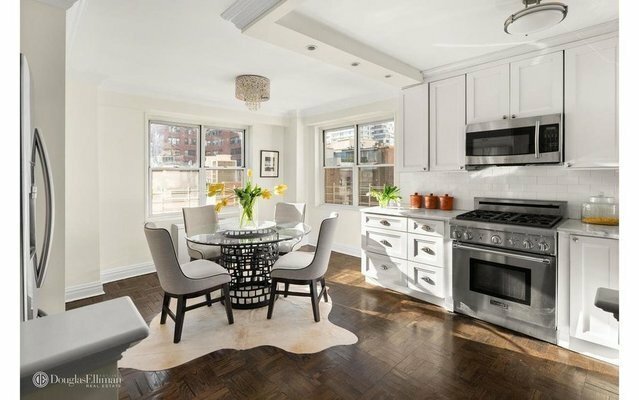 Welcome home to one of the most desirable locations on a tree-lined block on the UES! Elegance abounds throughout this apartment, which is bursting with sunlight from its northern, eastern, and southern exposures. An exceptional, spacious layout provides wonderful family and entertainment space and complete privacy with two master bedroom suites. Enter through the large foyer with ample storage, and step into the open living space, which includes a living and dining area with northern city views and additional storage. The large, modern eat-in kitchen boasts eastern city views, updated cabinetry with pantry space, marble counter tops and stainless-steel appliances. Directly off the foyer, you enter the first of two master suits, each with beautiful walnut flooring and spa-inspired en-suite bathrooms finished in luxurious Carrera marble. The second master suite is located off the living area and features magnificent closet space within its en-suite bathroom. A third full bathroom is located near the living area and the third and fourth bedroom ? both feature southern city views and large closet space. This apartment also includes an in-unit washer and dryer. This location is close to eight subway lines, Bloomingdale's and other exquisite shopping, delightful restaurants, and Central Park. Building amenities include a garage, gym, residents' lounge, bike room, full time building staff and live-in super. Sublets are allowed after one year of ownership (limited to two years) and is pet-friendly. Pieds-a-terre, foreign investors, sublets and guarantors are permitted within this flexible Coop, with condo-like rules.